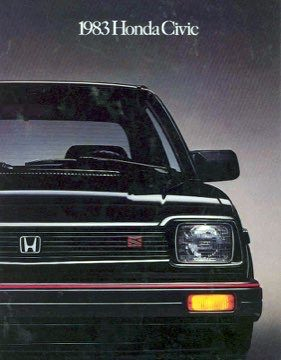 Finding detailed information about the 1983 Honda Civic S turned out to be surprisingly hard, so this is my first “Short Take”—a post that I don’t consider long enough to be a full discussion. Honda continued to hit on all (four) cylinders in 1983 with the introduction of the Civic S. At $6,399 (about $16,400 in 2019 dollars), the 1500 S was the top of the two-door hatchback line and over 30% more than the base 1300 model. The engine in the S was not specific to it, but was the optional EM 1.5 liter/91 ci inline four with a three barrel carburetor, making 63 bhp. Mileage with the standard five-speed manual transmission was 35 city/46 highway by the standards of the day. 0-60 came in a little under 13 seconds, and top speed was about 99 mph for the last of second-generation Civics. A handsome little car, the Civic S was fitted with firmer suspension (with rear stabilizer bar) and 165/70R13 Michelin tires (a size still available thanks to Vredestein) on 13-inch wheels. A red accent stripe encircled the S and set it apart from other Civics as well as a black grille and blackout paint around the window frames. Standard equipment on the S included a front spoiler, a tachometer, and a quartz digital clock. Standard equipment on all 1983 Civics included front wheel drive, rack and pinion steering, power-assisted front disc/rear drum brakes, and MacPherson struts on all four corners. Inside, full carpeting, reclining front bucket seats with adjustable headrests, and a fold-down rear seat were included. There were only two color choices for a 1983 Civic S. Make mine Black, please. My first car was a 1980 Civic 1300 four speed manual. Although it was not as fast as the 1500 S, it handled well, was reliable and got somewhere in the lower 40s on the highway. I spiffed it up by adding a 1500 s style red line through the bodyside molding and painted the bumpers matte black. I love that car. It ran for 244k miles on the original engine before I gave it up. 244,000 miles on the original engine is impressive—you must have fed it a steady diet of engine oil. I love the Hondas of the eighties; the company really seemed to know exactly what the market expected of it. I was surprised to find so little information about these cars on the internet, which is why this post only got enough content to be a short take.